Here you will find a selection of day-long workshops (6 hrs) covering a range of projects and activities. Please enquire if you would like to book a group or party. Please note, we require a minimum of four people per workshop. Often viewed as the literal pain of the garden, the common nettle has a multitude of uses with quite a few health benefits. 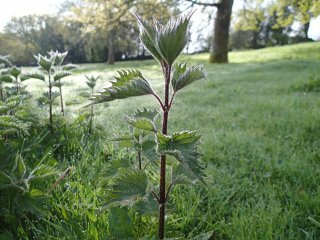 In this workshop you'll learn to safely forage for nettles and turn them into a variety of products that can be eaten, drank or worn decoratively. This workshop is offered during early spring to late summer only. 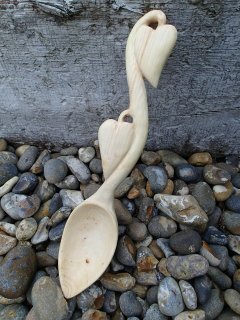 Presented as a romantic gift to a loved one, the traditional Welsh love spoon is decoratively carved with romantic symbols to represent the skill of the wood carver. For the most part they are used as decorative craft items. However, in this workshop you'll learn to carve a more robust spoon that can be practically used as part of a salad bowl or picnic set. 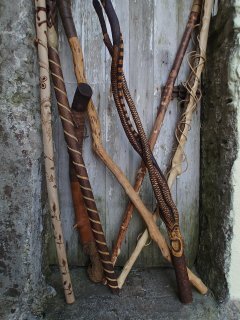 Be a wizard's apprentice for a day and carve your own wizard's staff. Try your hand at symbols, faces or patterns using a range of carving tools and knives, using a mixture of chip carving and whittling to create your own highly personalised stick. Are you one of those people who carries a rope with you when out on a walk, because you never know when you'll happen across the perfect tree for a swing? Or do you have a tree in your garden that you just can't wait to dangle from? 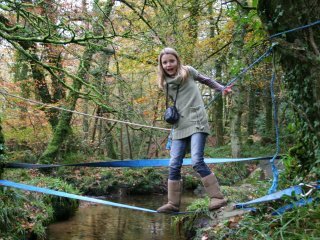 If so, this workshop will provide you with the guidance and experience for hanging a variety of temporary 'play' structures from trees. So you want to get the family out walking more, but they're just not excited by the prospect? 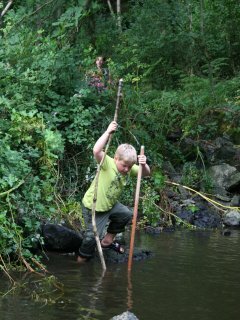 This workshop provides lots of practical ideas and examples for using story and narrative in the creation of 'mini quests' that encourage reluctant walkers to get outside and enjoy walking. The Story Walking approach diverts attention away from the physical activity and focuses on the ways landscapes can be brought alive to make walking a fun, intriguing and pleasurable experience.